... to the world of practical psychology! 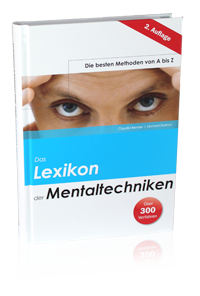 With «The Encyclopedia of Mental Techniques» we present the most comprehensive collection of modern mental techniques ever assembled in one volume. As professional trainers each with many years of experience, we were able to compile the best techniques and to present them in what we hope will prove to be an engaging and useful manner. More than 300 established methods are systematically structured. They all include a short description with instructions, duration, application guidelines, side-effects and contraindications, difficulty level (from 1 = very easy to 5 = very difficult) and our personal comments. On this website you find the links mentioned in the book. For each technique we selected inspiring and informative references and articles out of the world wide web. We hope the reader will feel inspired to dive in and try things out! We are very keen on your feedback! Compliment, criticize or give suggestions and advices! We look forward to your comments and hints! We wish you, dear reader, many new and interesting insights into the world of practical psychology! Have fun with our life’s work. Dipl.-Psych. Claudia Bender Michael Draksal, M.A. NEW! The encyclopedia is also available as an App for iPhone, iPad and Android Smartphones.